How to do a trademark search yourself? - Reggster If there is any additional information you would like us to take into account, please indicate that below.If there is any additional information you would like us to take into account, please indicate that below.If this is your first filing for this trademark, you may be entitled to protect your trademark in other countries with the same priority (application date) within 6 months.If this is your first filing for this trademark, you may be entitled to protect your trademark in other countries with the same priority (application date) within 6 months.You can claim priority if you have made an identical application for the same trademark in the last 6 months in another country. If you select "yes", we will contact you to verify whether you are eligible to claim priority (effectively an earlier application date)You can claim priority if you have made an identical application for the same trademark in the last 6 months in another country. If you select "yes", we will contact you to verify whether you are eligible to claim priority (effectively an earlier application date)If these goods and services below to other classes than chosen above, extra government fees apply. In that case we will contact you before filing the application.If these goods and services below to other classes than chosen above, extra government fees apply. In that case we will contact you before filing the application.This is only for communications between you and as. The information will not be disclosed to EU trademark office.This is only for communications between you and as. The information will not be disclosed to EU trademark office.Write here the full legal name of the applicant. The application will be filed in the name of the entity identified here. Make sure that the name is correctly written. Include the legal form (e.g. "Limited Company") in the name.Write here the full legal name of the applicant. The application will be filed in the name of the entity identified here. Make sure that the name is correctly written. Include the legal form (e.g. "Limited Company") in the name. Trademark rights are typically national. If you want to use and register your trademark in China and Japan, searches should be made in those countries. The European Union provides an exception. If you want to use and register your product in Germany, you should check prior German and EU trademarks. Trademark searches should be done in those countries where you are planning to use your trademark, and if those countries include EU countries, you should search EU trademarks as well (in addition to national trademarks in those EU countries). Most countries have their trademark registers available online for free. These are the databases you should search. In addition, the EU Intellectual Property Office (EUIPO) and World Intellectual Property Office (WIPO) have databases that include the information from large number of national databases. If you do your search alone, these are the most effective tools to do it. In principle, executing a search is relatively simple. You input your trademark and select relevant goods and products classes. For example, if you are planning trademark WWEEWW for shoes, you input your trademark name and select class 25 (this class contains shoes). If you receive not hits, nobody has registered the same trademark. Most companies will happily conclude from this that all is well. Well, not necessarily so. The fact that nobody has registered the same trademark does not necessarily mean that you’re in the clear. You can run into problems if somebody has registered a similar trademark for similar goods. For example, if somebody has registered WWEWW for shirts, that will be a problem. The challenge is not finding exact hits (identical trademarks), but trademarks that are similar enough to cause concern. This has traditionally been the difference between free databases provided by intellectual property offices such as USPTO and commercial service providers such as TrademarkNow. EU trademark office provides a reasonable tool for this problem. In the TmView database it is possible to search also for non-identical prior trademarks. We have found the information there to be mostly accurate, but sometimes there can be serious omissions in the results. Therefore the results are often indicative rather than definitive. Step 1 – Start the search by going to ​https://www.tmdn.org/tmview/welcome and click “advanced search”. Step 2 – Enter your trademark in the “Trade mark name” field. Enter the correct trademark classes in the “Nice class” field. How to find a correct trademark class? Check them here. Step 3 – Execute the search by hitting “Search”. You will get the corresponding results below. Step 4 – Refine your search parameters. 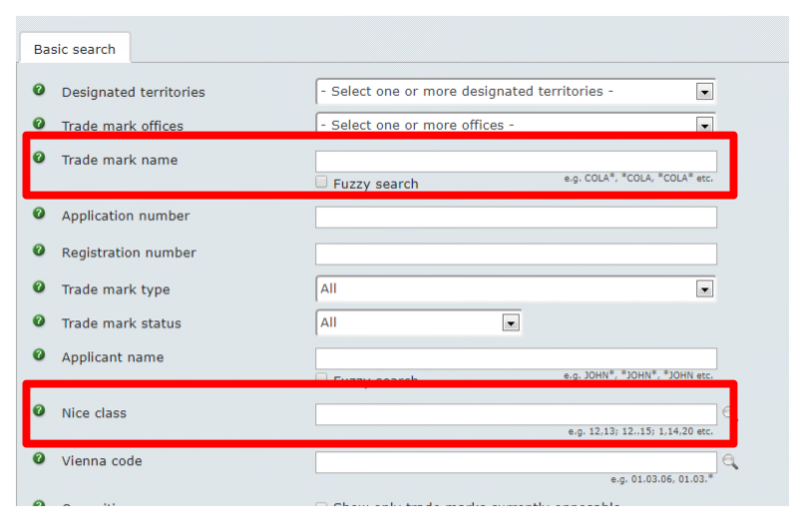 If you didn’t receive any hits and would like to expand the search, click the “Fuzzy search” under “Trade mark name”. This will expand the scope of the search to include trademarks that are not identical. Especially the second part requires more in-depth analysis. The hits are based on the class numbers chosen for the search. If you search in class 9, you will be hits in class 9. However, class 9 contains a variety of products, so the mere fact that a prior trademark exists in the same class is not determinate that the products are similar. For example, a company manufacturing spectacles would conduct the search in class 9. Since software and electronic products also belong to class 9, many of the hits might be software products and therefore not relevant for the search since software and spectacles are sufficiently dissimilar products. It is therefore important to review each hit individually paying attention to the actual list of goods and services, and not rely on the class number. We of course recommend proper searches before committing to any particular trademark. If for cost reasons (or for other reasons) you decide not to order trademark search from your intellectual property attorney or other service provider such as TrademarkNow, you should at the very least do a TmView search according to the instructions above. We cannot promise that you will be able to cover every possible obstacle, but the chances are that if there are prior registrations that would cause obvious problems, you might be able to spot them before making a trademark application or asking your trademark attorney to make the application for you.